Register Grantee trust Bank iRefer and Earn Money on Referral. HomeGTBankRegister Grantee trust Bank iRefer and Earn Money on Referral. I am not sure if there's been any other local bank that rewards their customers for introducing a family member, friend or colleague to open a bank account with them. GTBank seems to be the first to employ this sort of strategy, which I can comfortably say that it isn't a bad idea for once. The GTBank iRefer Program is a way the bank appreciates their customers for inviting their friends, families, and colleagues to open and maintain GTBank accounts. And here is how to benefit from it, but first, here are the things you should know. • In order to get paid your commission for referring customers to GTB you need to make sure the referral code you use is correct! • There must be an activated GTbank nairaMasterCard that is associated with the account. How to Register for GTB i-Refer Program? Steps How to Register for GTB i-Refer Program? 2. An i-Refer code is generated for every family and friend you refer. 3. Your referred family/friend receives an e-mail prompting them to open a GTBank account. 4. GTB will reward you with N100 for every successful referral you make and you can refer as many people. 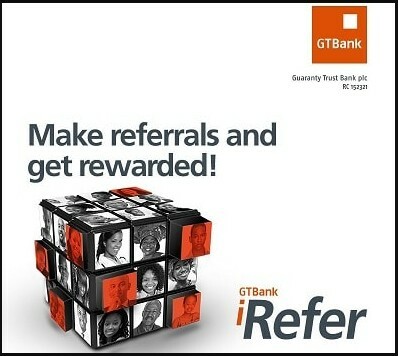 Please note that the Unique Referral Code for GTBank i-Refer program must be provided by the Prospect Customer at each point of opening the Referral Account before the referral will be recognized by GTBank. Failure to this will lead to loss of reward. So do you think that the GTBank i-Refer Affiliate Program is going to work? Do you think ₦100 referral bonus is worth hustling for? Please let us know your opinion via the comment box.